The Stratosphere is not the largest hotel, nor does it have the biggest casino. 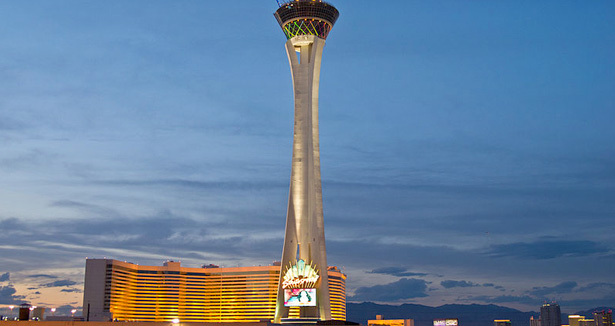 But it’s got something that is nowhere else in Las Vegas or anywhere else: The Stratosphere Tower. The Tower, as it’s known locally, is 1,149 feet high. At the top is the famed revolving restaurant and entrances to the rides. With both indoor and outdoor observation decks, the 100-story structure also offers a lounge, restaurants and, of course, a spectacular view. The windows come down to the floor at an angle so it’s possible to look straight down and see what’s below – nothing but air. In 30 seconds the double-decker elevator will rush to the top at 1,800 feet per minute or three floors a second. Naturally, you’ll want to travel down a little more slowly. Apart from the observation deck itself there are several thrill rides that are enormously popular. The Big Shot, X-Scream and Insanity are all aptly named. Any one of them is enough to exhaust your adrenalin long before you start gambling. But then, gambling that you’ll stay on is what these rides are all about. The Big Shot is almost 1,100 feet high and qualifies as the highest thrill ride in the world. The Insanity is less high (900ft), but by spinning riders at 40 miles per hour, it earns its name anyway. X-Scream is a ‘mere’ 866 feet, but by dropping riders over the edge it too is aptly named. For those who prefer to get married with a view, there’s The Chapel in the Clouds. A large number of people every year still come to Vegas to get married and this choice is definitely better than the standard cheesy chapel off The Strip. But there are other forms of entertainment as well. The vampire-themed adult revue ‘The Bite’ could only have been conceived and executed in Las Vegas where the unusual is the norm. Then there’s the American Superstars show where the celebrity look-alikes get a chance at stardom while you laugh. The hotel is located at the northern tip of the casino group on The Strip and is the only one actually located in the City of Las Vegas proper. The others are technically in the suburb of Paradise. With 2,444 rooms and an 80,000 square foot casino it’s by no means the largest, but it might very well be the most unusual. Completed in 1996 it didn’t do box-office business at first, but its location eventually proved to be an advantage. It’s centrally located between The Strip and downtown, which is convenient for those who want to see it all, including Fremont Street. The rooms are inexpensive but adequate, and few go to Vegas to sleep anyway. On the other hand, there are plenty of games in the casino where you can spend a lot more money, so never fear. Save that for the rides.